This collaborative event is part of the Living Room Theatre series presented by the NC Black Repertory Company. Miami, Florida, 1984. 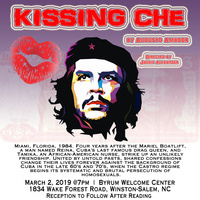 Four years after the Mariel Boatlift, a man named Reina is dying in a nursing home claiming to have been Cuba’s last famous drag queen and to have had a passionate love affair with the Cuban revolutionary Che Guevara. Tamika, an African-American nurse, strikes up a friendship with him. United by untold pasts, shared confessions change their lives forever against the background of Cuba in the late 60’s and 70’s, when Castro regime begins its systematic and brutal persecution of homosexuals. About Living Room Theatre: From October 2018 through May 2019 NC Black Rep will produced one staged reading per month of new plays by nationally recognized up-and-coming writers at locations throughout the city of Winston-Salem that are site-specific to the play’s subject matter. The readings will be free to the public and target underserved members of the community such as the elderly, the LGBT community, low-income residents, and others who may not otherwise have access or the means to enjoy live theatre, and whose stories are often marginalized by society.